Psalms 96 to 98 appear often in the Lectionary, particularly at Christmas but also at other ordinary times during the year. The triplet forms a joyful package for a joyful occasion: these three songs for Christmas sing out in praise of the creator, the source of goodness, and imagine a responsive jubilant creation. Illuminated capital of Cantate Domino in the Henry VIII Psalter, c.1540. British Library. As indicated by the many marginal notes added in the King’s own hand, the volume became Henry VIII’s personal copy of the Psalms. So it seems that the psalms had high profile in earlier times. And since Henry was also a respected musician and singer, he may also have sung his psalms. 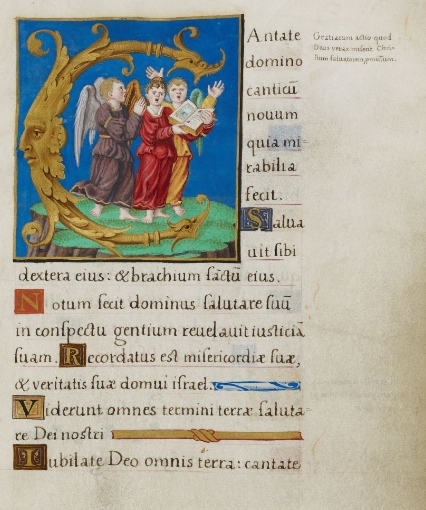 The illustration appears in Psalm 97 folio 118r (our 96) showing angels singing within an ornate golden initial capital of Cantate Domino – ‘Sing unto the Lord’. The rest of the poem brings in more rejoicing in a universal sense, to include the earth, seas, heavens and all living creatures and peoples. Some verses are repeated from other psalms such as 29, 93 and (relevant in this clutch of readings) 98:7-9. It’s also the source of that sweet phrase ‘the beauty of holiness’. For such an important occasion everyone wants to sing a new song, it seems. Sure enough, there are dozens of settings ancient and modern of this psalm, or at least the opening phrases. Nearly all classical settings confine their scope to the first two or three verses starting with Cantate Domino. Claudio Monteverdi, Orlandus Lassus, Heinrich Schütz and Jan Sweelinck produced some similarly demanding works. However, there are also several other nice songs within reach of amateur groups. A trio by Lassus (last system of Prima Pars shown) would be a strong contender. There are eight in Psalms for All Seasons alone. One of them (96G) even stretches the text to: “Sing to the Lord no threadbare song, no time-worn toothless hymn, no sentimental platitude, no empty pious whim.” OK, we get the message. Together in song, albeit characteristically ignoring some verses (and gender inclusiveness), does at least cover all these psalms in song numbers 54 to 57, mostly in our favoured responsorial style. New Century has another simple refrain but with a hidden surprise. The tune by Jane Marshall, 1994, is nice enough. No chord symbols are added but on closer inspection of the harmonisation, an unusual twist can be seen. The chords all behave themselves with due modesty, clustering mildly around the root Eb major, the sub-dominant and related minors. Then at the end, Jane sends us an unexpected rising swell to lift us to a final III chord, G major. Good one. And while we are riding the wave, Everett in TEP provides his usual innovation with a two-part canon. He draws on verses 7-8 but, as he says: “mimicking the rise and fall of the seas mentioned in verse 11”. In many churches, Psalm 96 is read on Christmas Eve, for example at midnight mass, while the next two psalms are listed for the great day itself. The ancient psalmists would assume that you will bring your own lyre, timbrel or sackbut to join in!